I'm using Creator Basic 9 (supplied with my PC). 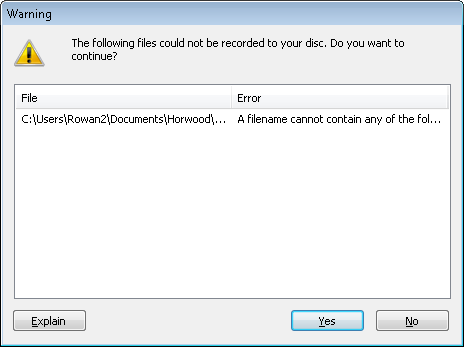 When I try to burn a couple of directories of files to a DVD, it shows me the attached error message. How do I find out which characters are not allowed in filenames, given that the end of the mesage is cut off, and the window is not resizeable or scrollable? How do I find out which of the hundreds of files is causing the problem? How do I find out which characters are not allowed in filenames? I fixed it - I discovered the columns can be made wider, and then you can scroll left and right to read the whole filepath and the whole message.